The weather, like the multicultural crowd, was beautiful. The music was danceable, the live artwork was politically conscious, and the tacos and aguas frescas were plentiful. Organized by Homies 4 Justice, an internship program of Communities United for Restorative Youth Justice (CURYJ), the fourth annual Reclaiming Cinco de Mayo event was lit. Homies 4 Justice provides paid internships where youth are trained to become community leaders and agents of change, and this was the first year that the family-friendly, alcohol-free event was organized by those youth instead of adults. Consistent with CURYJ’s strategy to empower youth by teaching them their history, the event is an attempt to reframe the American holiday that is not really celebrated in Mexico outside of the state of Puebla. “We want to move away from Drinko de Mayo towards Cinco de Mayo,” said CURYJ Executive Director George Galvis. The event is also a platform for CURYJ’s campaigns: seeking an end to the practice of trying youth as adults; advocating for a shift in resources to priorities that help people instead of hurting them, and; resisting divisive federal immigration policies. Staffed by system-impacted individuals, CURYJ works to help youth minimize contact with the criminal justice system because that leads to negative outcomes. 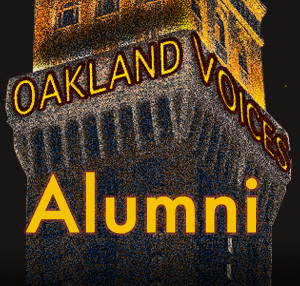 Michael Muscadine, a mentor with Homies 4 Justice and a Community Organizer/Life Coach with CURYJ, pursues that goal armed with a wealth of knowledge about the “real history that isn’t taught in school” about the western hemisphere and Oakland in particular. Native American, Mexican, and Italian, Muscadine grew up in Fruitvale. His family has been in Oakland since the 1900s, and in the house he grew up in since the 1960s. 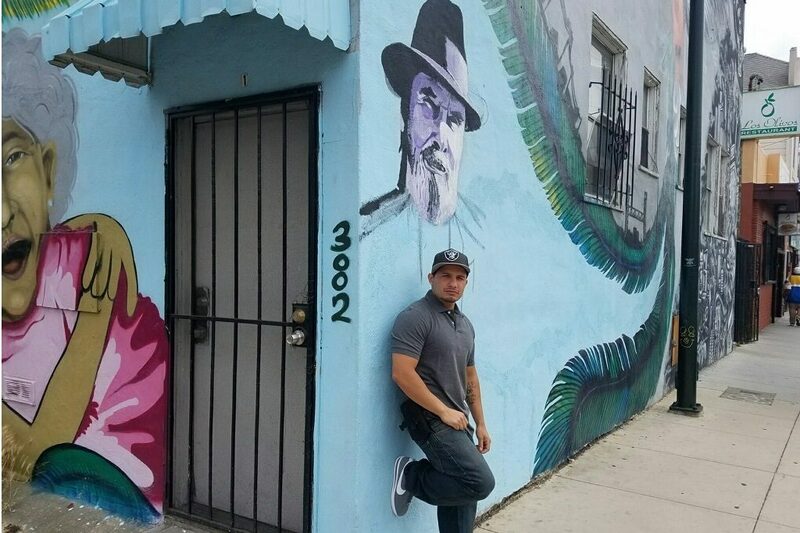 He has also taught Ethnic Studies to a young men’s support group at Dewey Academy that he is actively trying to bring back, has organized a community garden in his neighborhood, and continues to organize community mural projects. His work empowering East Oakland youth and elevating their voices is important because of his own personal history. “I was that same individual,” says Muscadine. He says he once needed someone who looked like him and came from the same community to give him guidance, and that the lack of life coaches and mentors in East Oakland made him want to work with youth ever since he was a teenager. 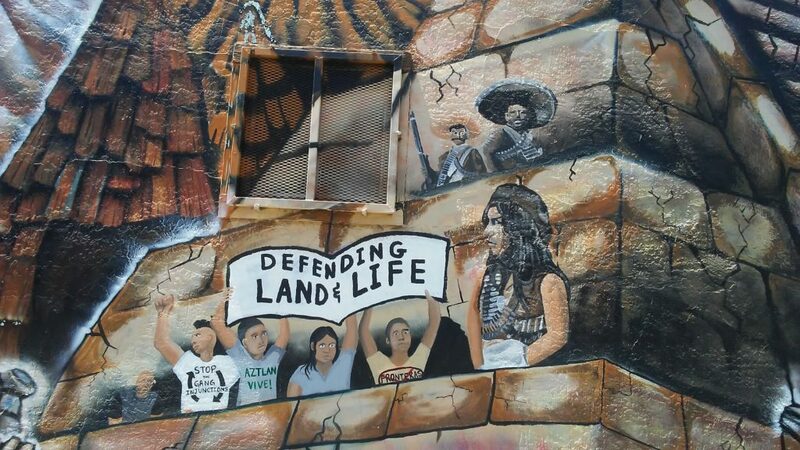 A community mural that Muscadine helped organize. This was one of the first acts of resistance against the Fruitvale gang injunctions. In 2012, Muscadine was named one of “42 of the worst” criminals in Oakland as a defendant in the failed Fruitvale gang injunctions implemented under Mayor Jean Quan. Allegedly aimed at minimizing gang activity, the black code-like injunctions were restraining orders limiting individuals’ mobility and freedom of association. Critics say that there was no clear way out of the program, the injunctions weren’t tied to criminal activity, and that mere ethnicity and street address could get you into the program. Additionally, even though the highest crime areas were in West and Deep East Oakland, the gang injunctions were only implemented in North Oakland and Fruitvale, two areas that have undergone severe gentrification in recent years. In hindsight, we now know for a fact that the gang injunctions lowered property values, no one was arrested for violating the injunctions, the City spent millions of tax dollars on the program, and the California Court of Appeals ruled the injunctions to be a civil rights violation. A portion of another community mural that Muscadine helped organize. 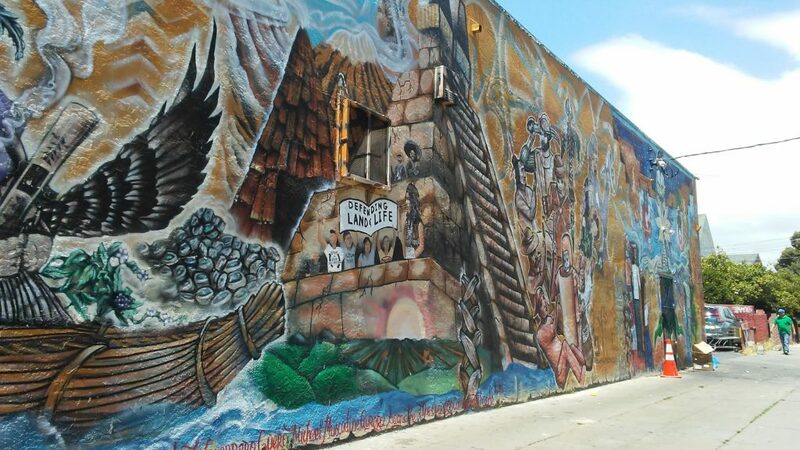 This mural was one of the first acts of resistance from the community against the Fruitvale gang injunctions. At the time of the injunction, Muscadine had one year left of probation, and was focused on getting off the radar of OPD. He had such a good relationship with his Parole Officer (PO) that despite being unemployed at the time, which should have labeled him as high risk, his PO categorized him as low risk because he saw how committed Muscadine was to turning his life around. He was actively seeking employment, staying in his community like he was supposed to, and focusing on building his relationship with his girlfriend, whom he is still with to this day. Muscadine saw the initial news conference announcing the injunctions on TV, but didn’t know what the program was or how it would impact him. Friends told him that there was a rally in downtown, so he went to see if he could make connections and find support resources. Luckily, people reached out to him. He considers his experience being a defendant in the gang injunctions to be a “blessing in disguise” because he met a lot of supportive people through it. He met folks that helped him get to where he is today, including Galvis, who would later found CURYJ with Muscadine and others out of the successful struggle against the gang injunctions. Muscadine says he would still be working in the trades if he hadn’t had the opportunity to start learning about his culture and heritage from people like Galvis. On the streets though, it was a different story. “I was a target again,” he says about becoming a gang injunctions defendant. He says that despite turning his life around, “rookie cops with itchy trigger fingers” harassed him. They followed him and stopped him, and made a point of letting him know that they knew who he was, even though they didn’t. Because he was at home in his own community trying to do the right thing, but the cops were brand new to the neighborhood and trying to intimidate him and others that he had grown up with, he felt the need to speak out against the injustice, and that’s how he ended up being a community organizer. He says that the harassment by OPD continues to this day. They still know his face, but they don’t seem to be able to get over the fact that he is no longer the 14 year-old kid who grew up without enough male role models in his lfe. Muscadine admits that he has thought about leaving Oakland, but he realizes that “somebody has to stay and do this,” and he is committed to his work disrupting the cycle of violence in East Oakland. Muscadine dreams of a community center that is not just a safe place for young people to hang out, but also where they can learn about their cultures and histories, develop job skills, and also give back to the community. Until then, he is committed to mentoring future generations through history, art, and activism. He is the epitome of what CURYJ stands for, and a valuable asset to East Oakland.